One can say, looking at the papers in this symposium, that the elucidation of the genetic code is indeed a great achievement. It is, in a sense, the key to molecular biology because it shows how the great polymer languages, the nucleic acid language and the protein language, are linked together. 'The Genetic Code: Yesterday, Today, Tomorrow', Cold Spring Harbour Symposium on Quantitative Biology, 1966, 31, 9. Possibly the most pregnant recent development in molecular biology is the realization that the beginnings of life are closely associated with the interactions of proteins and nucleic acids. 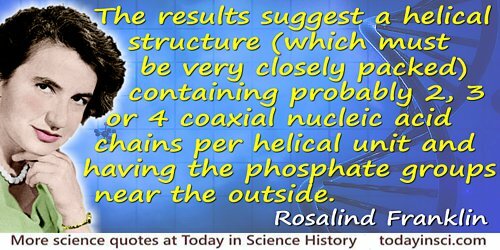 'X-ray and Related Studies of the Structure of the Proteins and Nucleic Acids', PhD Thesis, University of Leeds (1939), 63. 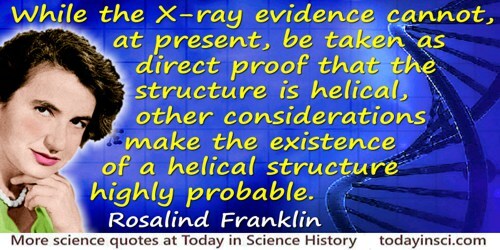 As quoted in Robert Cecil Olby, The Path to the Double Helix: The Discovery of DNA (1974), 70.